Fried chicken liver or pritong atay ng manok should be breaded or with batter coating so it will not be too tough and too dry. The breading mixture will make the liver moist and soft. 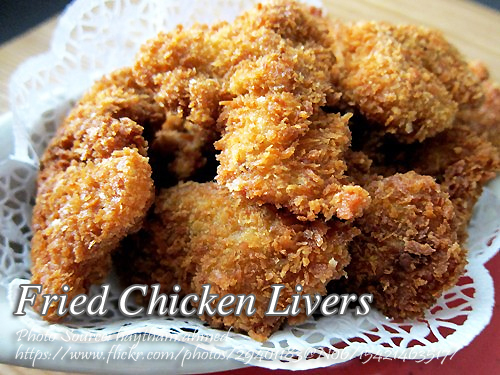 If you want to try a little exotic fried chicken, why not try cooking and serving this fried chicken liver? As you notice in the recipe, it contains buttermilk. Most Filipino dishes doesn’t ask for buttermilk and it is obvious that this is not a truly Pinoy cuisine. So why use buttermilk? buttermilk tenderizes the meat because it contains acid and imparts a good flavor. You can also use it on fried chicken. So that is why you can substitute buttermilk with milk and kalamansi juice or lemon juice which will act the same as the buttermilk. To make the buttermilk; Combine the milk and the lemon juice and stir. Allow the milk to rest for at least 5 minutes but no longer than 10 minutes. When the milk is slightly curdled, the buttermilk is ready for use. I want to receive the mini e cookbook. I see on my mailing list that you already subscribed. I’ll just email you the ebook if you are having a problem on downloading the ebook. You receive it on your email.